prox. Comment welcome. Enriched waterfowl pond, Northamptonshire, UK. 18 Aug 2016. © C.F.Carter(chris.carter'at'6cvw.freeuk.com. Published in: Deflandre, G. (1930). 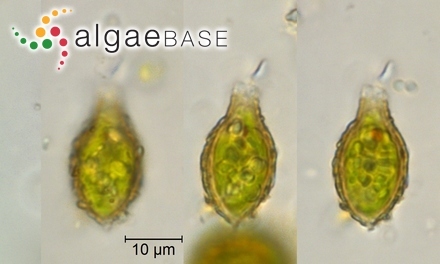 Strombomonas nouveau genere d'euglénacées (Trachelomonas Ehr. pro parte). Archiv für Protistenkunde 69: 551-614. The type species (holotype) of the genus Strombomonas is Strombomonas verrucosa (E.Daday) Deflandre. Brosnan, S., Brown, J.P., Farmer, M.A. & Triemer, R.E. (2005). Morphological separation of the euglenoid genera Trachelomonas and Strombomonas (Euglenophyta) based on lorica development and posterior strip reduction. Journal of Phycology 41: 590-605. Stutz, S. & Mattern, H. (eds), Helisch, H., Hennecke, M., King, L., Schütz, W. Schweikert, M. & Van de Vijver, B. (2018). Beiträge zu den Algen Baden-Württembergs. Band 2 Spezieller Teil: Euglenozoa und Heterokontobionta p.p.. pp. -451, 382 figs. Remshalden: Verlag Manfred Hennecke. Wołowski, K. & Walne, P.L. (2007). Strombomonas and Trachelomonas species (Euglenophyta) from south-eastern USA. European Journal of Phycology 42(4): 409-431. Accesses: This record has been accessed by users 1387 times since it was created.